In Early Offense or a controlled transition situation there are many ways to attack the defense and many different strategies that can be employed. A few include the Drag or Double Drag and what we refer to as the Pitch Series. At the Prep School or Collegiate level I am a big proponent of the Pitch Series, which we will review shortly. At the Professional level or in particular instances the Drag Series can certainly be deadly. The issue with the younger players is the lack of understanding that we do not need to score on every ball screen. While todays players see infinitely more ball screens than any generation in basketball history, their ability to actually use the screen and maintain quality pace and decision-making is something that is sorely lacking at the grassroots and college level (for the most part). I attribute this to teaching and skill development at the grassroots levels, an issue we will address in another post. But first lets dissect the Pitch Series, why it can be deadly and how it has worked at the highest levels. The pitch series is predicated on proper floor spacing and most importantly “pitching” the ball up the court, using the pass to create the scoring opportunity and letting the ball do the work. Like in most Early Offenses the first big down the court sprints to the ball side block and the 2 and 3 sprint each wing. I love to emphasize the ball crossing half court with the pass and not the dribble. We separate our series into 3 looks and 3 counter looks. One of my favorite early offenses, Pitch Cross provides a plethora of options that can be reads or calls depending on how your players progress. The basic look involves the 1 pitching the ball ahead to the 2 on the wing. The first look is always straight to the post for a quick bucket. If that is not available the 2 will then reverse the ball to the 4 who is trailing the play (usually due to taking the ball inbounds). After kicking the ball ahead the 1 shallow cuts and pops to receive the ball on the 2nd side wing. The 3 who ran the weak side wing settles at the block for a post up opportunity. 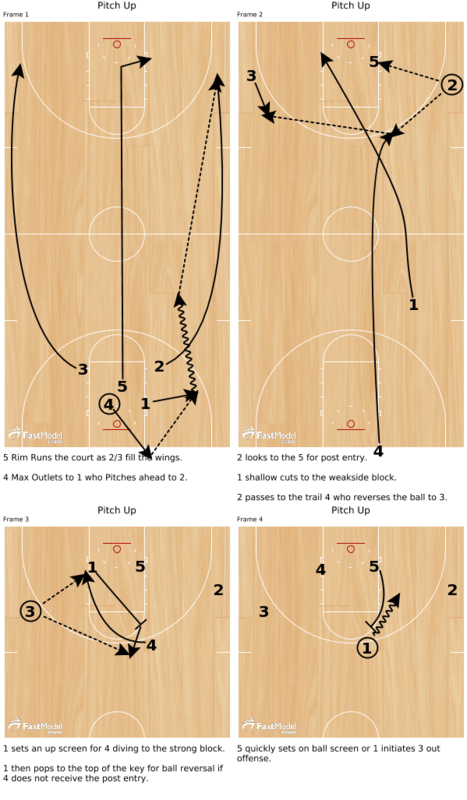 If one does not present itself, the 3 then initiates cross screen down screen action by screening for the 5 who looks to post and receiving a down screen from the 4. The looks are to the post, to the shooter and if nothing presents itself whatever your motion principles are can kick in. For instance, if the ball hits the post and cutters dive and clear opposite ball reversal back to the 1 can initiate SPNR on the 3rd side. The same goes for a reversal to the 3 who doesn’t have a shot. The 3 can then swing back to the 2 and again initiate SPNR action. What about the tweaks or reads, lets review. From the block-to-block screen, the 5 can sprint to set the Step Up or SPNR on the 1, hopefully gaining a two-step advantage off of the screen and arriving without his defender attached. If you have an athletic 4 man the 3 can set the cross screen and then follow that up with a back screen for the 4 and initiate a lob. What if you have a 5 that can shoot then the cross screen down screen can almost act like modified flex action, the 5 simply sprints off the down screen and the 3 can follow that will a rub screen for the 4 to the post. Another one of my favorites is dropping the Hammer screen on this look for a corner three pointer. 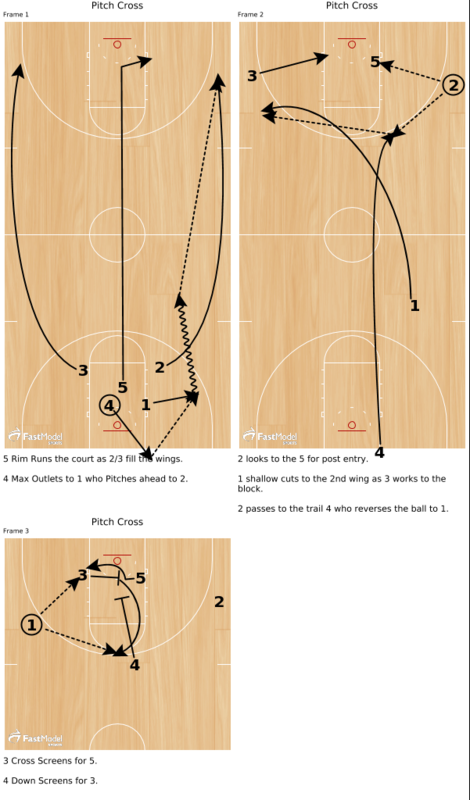 The 5 sprints to SPNR off the cross screen and the 1 force rejects the screen to the baseline. Instead of using the down screen the 3 settles at the block and sets a Hammer screen for the 2 who drifts to the corner for the hopefully game winning three pointer. As you run this you will notice that the 1 can potentially have some major issues receiving the ball on the shallow cut, hopefully self-respecting point guards will deny the reversal (If not those long hours of shell drill have no kicked in). If this proves to be too much the 4 can simply go DHO back with the 2. I am not a proponent of the ball going back where it came from but in the case where it’s necessary there are some great counter options. The 3 who will have settled at the block preparing for the cross screen will now receive a baseline staggered from the 5 and the 4. Immediately after the DHO the 4 continues to set the second screen and it looks a bit like wheel action. Options on the finish if the 3 does not have a shot are block to block 4-5 cross screen for a post, or for an SPNR. Another one of my favorite Early Offense looks we call Slice. Again the 1 pitches the ball ahead and again the 2 looks to reverse the ball to the trailing 4 man. The difference is that after the 1 hits the 2 (or goes DHO with the 2) the 1 fills the strong side corner. The 4 will then reverse the ball to the 3 on the weak side. The 5 then steps to set a screen on the 2 for the slice cut (a great opportunity to post a strong guard). After setting the screen for the 2 and after reversing the ball to the 3, the 5 and 4 then set a double staggered screen for the 1 and wheel action is initiated. As the 1 receives the pass, the 5 and 4 continue to screen the 2 who looks for the shot off the second double staggered. To close the play the 4 cross screens for the 5 and post up action can ensue or an SPNR. Once again the 4 to 3 ball reversal will become the most difficult aspect. Now because this is a naked side, there is a great opportunity for a back cut. This can come off the pump fake or the classic dribble at but of course the 4 and 3 must be on the same page. If no reversal is open the 4 can then DHO back with the 2. That can then be followed with a 5 and 4 pin down on the 1 and complete the wheel action by sending the 3 through off the final double staggered. Pitch Up, or as I like to call it Obrigado (in honor of the Brazilian national team, which loves to run this action) is a great way to get early passing and second side action for the trailing big. In this look once again the 1 pitches the ball up the court to the 2, only this time instead of shallow cutting he cuts diagonal on a straight line to the weak side block. As the ball is reverse from the 2 to the trailing 4 man the 3 pops out to receive the ball. Now instead of block-to-block action the 1 sets and Up screen for the 4 man who cuts hard to the strong side block. The first look is to the 4 and this is great action to get the 4 man into the post early and off of action that has great movement and is not stagnant. The better the screen set by the 1, the more his defender has to help and bump the cutting 4. This opens the 1 up at the top of the key for a pass from the 3. 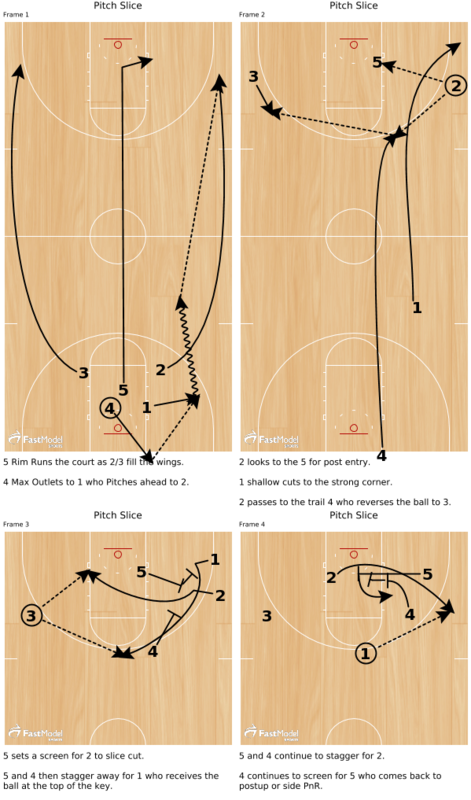 In the name of quick and consecutive action as the pass goes to the 1, the 5 sprints to set a Middle PNR for the 1. The 4 can replace up to the slot or space to the duck in area. As is the case with all Pitch action the hardest part is the full reversal from the 4 to the 3. Should the reversal pass be denied to the wing, the same action as before can be initiated and that is a DHO with the 2. The 1 who is on the weak side block will then receive a baseline-staggered screen from the 5 and the 4. That can again be followed up with a 4-5 block to block into an SPNR or post up. To me this action does many things, obviously it creates some looks for post ups and some down screens and of course some double staggered screens and 3rd side PNRs, but what I like the most about the action is the passing. What I mean by that is the fact that it gets everyone involved in the offense and it does so quickly. Three passes in the first 8 seconds can force an early defensive rotation and perhaps an advantage. This can keep our offensive players engaged and locked in, knowing they will get a touch on the ball is sometimes that carrot we need to entice (for lack of a better word) them to buy into the cause. Perhaps it will make them more likely to drift to that empty corner when we need, perhaps the offense will be able to then flow in an organic nature that was nurtured by structure. As coaches we surely don’t want to handcuff our players but to the same degree that beautiful basketball that we all love to watch and players love to play is the kind that involves 5 guys working as 1 (how corny is that? But how true?). Sometimes players just need that nudge, perhaps this is a way to do just that. One thing that I think resonated with me as a player and one thing that I hope I can pass on to my players is how to take something that seems highly structured and make it organic or instinctive. I think that in Spain they did perhaps the best job of this and the way we were taught gave us freedom within framework. That means we learned each option in a breakdown setting. Similar to my previous newsletter (link to newsletter here) guard and big breakdown drills give repetition and certain level of comfort, after that the big and guard combo drills give a level of chemistry and finally 3 on 3 is where exploration and innovation can really breed success. Hopefully you will find some value in the topics discussed and if you have any feedback or suggestions please don’t hesitate to contact me Cody@elev8si.com (505)228-3939, I love to chop up hoops whenever possible. Once again best of luck as the season moves forward.